This year I didn't get as much as I think I usually get for gifts, no one will tell me what they want and I seriously am having trouble coming up with anything to get them!! Also, most of the gifts that I have managed to get I have ordered and haven't gotten them yet. So, here is what I got this year on Black Friday and most of it was to update my winter wardrobe and will be featured in outfit posts in the next few months. First I went to Target because I wanted this red knit blanket to add to my Christmas decor that I knew was on sale at Target for only $10, You can find this super cozy blanket here. Then, I went to Old Navy and went a little crazy...everything was 50% off and I basically used that as an excuse to go a little crazy! I got these EXTREMELY soft black fleece pajama bottoms, which you can find here. These sweaters a so great! I already had two of them and decided to get these three other colors. You can find them here. I got this super soft and cozy top that will be perfect for comfy day, you can find it here. I got this top, which I already had in navy and white so I knew I liked it, it's a really thick knitted material which is better than a thin shirt. You can find this shirt here. I don't think I have ever gotten Old Navy flannels before but they are super soft and I seriously have no clue where all my flannels went I think I have like one left! You can find these flannels here. 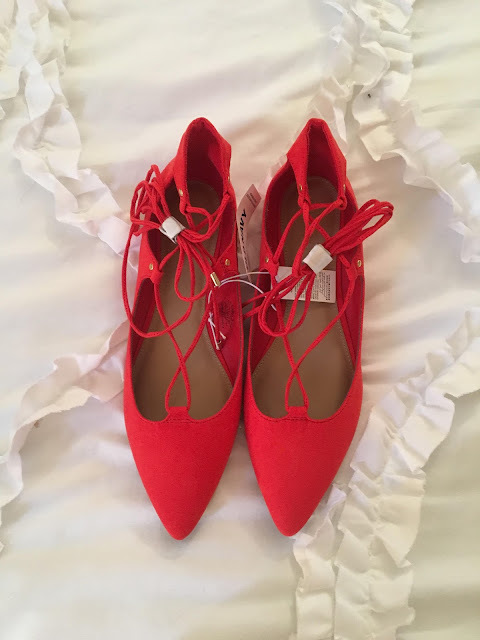 One thing I have been on the hunt for this winter is red lace-up flats, and I found them for an amazing price!!! You can find these adorable shoes here. I cannot wait to do a fun Christmas post with these fun shoes! After that, I went to American Eagle, and the amount of people in that store waiting in a line that wrapped around the entire store it was insane! Everything was 40% off but I didn't really look there much and ended up only getting a few random things. Find the light grey socks here, and the dark grey socks here. I also picked up this really nice thick hat for my brother, which was a great deal, you can find it here. American Eagle is currently still 40% off! The last store I went to was TJMaxx and HomeGoods, which didn't really have any sales I just stopped there to look for more gifts...which I again didn't manage to find. But I did find some really pretty wrapping paper!! While I was standing in line I saw this Batiste dry shampoo which I have heard great things about so I am excited to try it out!